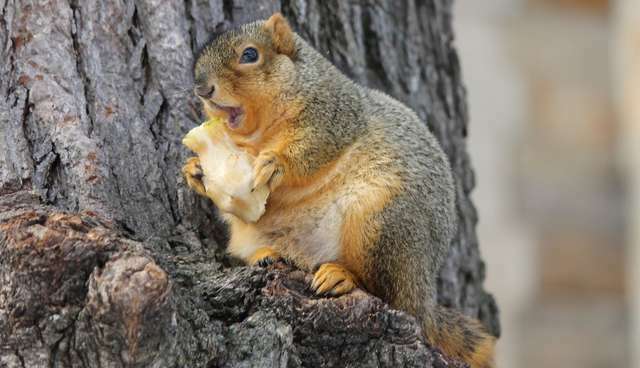 If squirrels have seemed a bit chunkier this winter, it's probably because they actually are. The reason for the recent thickening is simple. According to experts in North America and Britain, unseasonably warm weather has given squirrels in both regions more time to find food, leading to localized populations of double-wide nut hunters in cities like Toronto and Cardiff. "We have had a really warm November," David Sugarman of the Ontario Science Centre told Metro Toronto. "Naturally, if you're an animal that's got to make it through the winter with little or no food, you want to pack in as much as fat as possible." In the United Kingdom, last month wasn't just the warmest December on record but also the wettest, resulting in increased production of squirrel favorites like acorns. "It's been a very odd, unusual year," naturalist Iolo Williams told the BBC. "Squirrels will eat anything, they are omnivores, so I would imagine [non-native] grey squirrels unfortunately will do very well this winter." Luckily, squirrels self-regulate their body weight and this year's extra ounces are unlikely to have any lasting health effects. "If the squirrel were able to stay chubby all year round, it might decrease its longevity," said Sugarman. "But eventually the snow is going to come, the cold weather will increase and they're going to burn off some of that extra fat." In the Southern United States, however, this winter has actually been colder than usual due to El Niño. So if southern squirrel watchers spot an impressively pudgy specimen, it's probably just because everything's bigger in Texas.